I owe this very simple recipe to my neighbor Manuela, an artist with a paintbrush and in the kitchen. For a great flavor, allow the zucchini to get a bit brown in places. This dish may be prepared ahead of time and reheated. Rinse the zucchini, cut off the ends and slice into thin rounds. Peel the garlic cloves, slice them in half lengthwise and slice the halves lengthwise into slivers. Heat the olive oil to sizzling in a frying pan. Add the zucchini and sauté over high heat for 5 minutes, stirring occasionally with a wooden spatula. 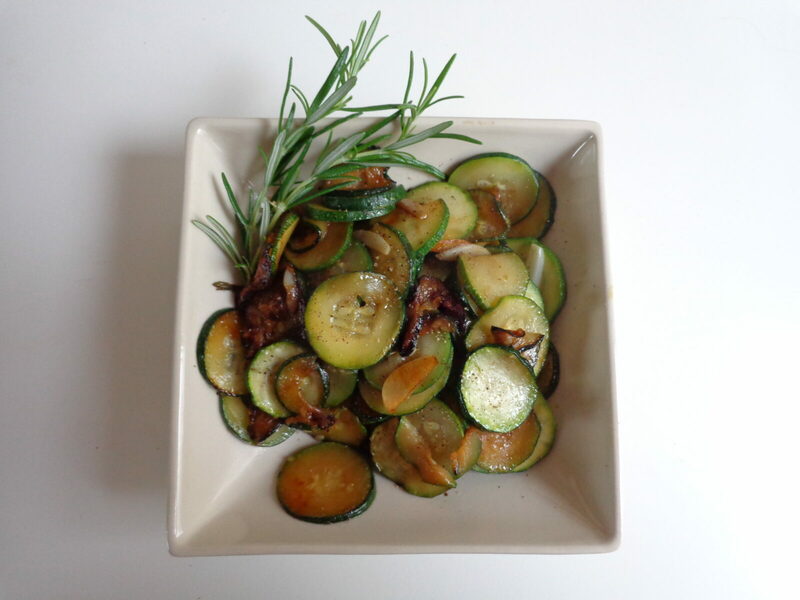 Add the garlic and thyme or rosemary, turn the heat down to medium high and continue cooking until the zucchini is tender, about 10 minutes more. Season with salt and pepper. Serves 2.